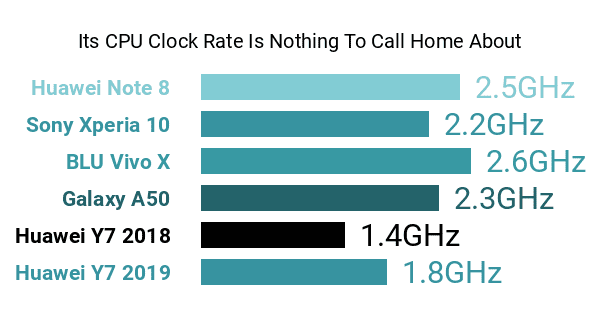 This 2019 edition of Huawei's Y7 mid-ranger is an overall upgrade over the 2018 model when it comes to technical pros and cons. That being said, we still think it could have done better in certain aspects. 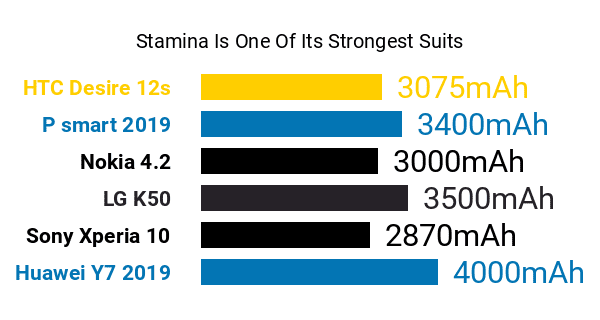 For instance, its Snapdragon 450 eight-core 1.8GHz engine and 3GB RAM count no longer sounded that promising as we were reviewing its specs, especially since the best octa-core-powered smartphones listed here on Phonerated run on roughly-2.5GHz engines and pack no less than 4GB of RAM. 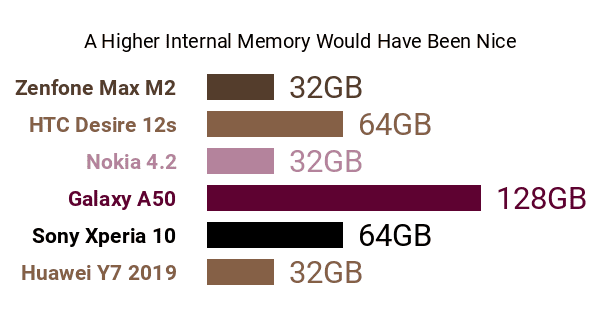 The Huawei Y7 2019's 32GB-only native memory might also put off some shoppers, knowing that some of its rivals offer 64GB or even 128GB memory caps. This con is easily brushed aside by its hefty 512GB maximum external memory allowance, though . Although it sticks to a 1520 x 720 HD+ display resolution , instead of shooting for at least a Full HD+ (1080p) sharpness, the Y7 2019 nevertheless resembles a lot of the best wide-screen phones of its time, rocking a 6.3-inch dewdrop-notch display with an elongated 19:9 aspect ratio . It is married to a polished ceramic texture on the back, with Coral Red and Aurora Blue among its color options. This Y-series model's pros also include a hearty 4000mAh battery that's accompanied by Huawei's AI power-saving technology, which might give it an edge versus conventional 4000mAh cells. By the way, be sure to pop open our list of the best big-battery phones here. Also accompanied by AI optimizations is the Y7 2019's 13- plus 2-megapixel double-lens main camera that's dedicated to bokeh photography more than anything else. Perched on its screen notch is a so-so 8-megapixel selfie camera. With all those pros and cons in mind, the Y7 2019 winds up as a viable choice for those in search of a mid-range smartphone with a wide display and a respectable battery.